A Heintzman piano is a musical time capsule. Most people see the piano simply as a piece of musical furniture, something for their kids to learn on, or for other people to master. Many people think of a piano as something to play as a form of recreation, or perhaps a skill that they could learn. A few people see a piano as part of their livelihoods, or an outlet for their passion. An instrument on which they express themselves and enrich their life, and the lives of those around them. I see the piano as being a connection to the history of creativity of humankind: A time capsule, a wonderful machine that does so much more than just work. It expresses our need as a species to create something meaningful and beautiful. 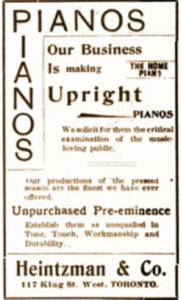 It’s not unusual to find pianos that are a century old. Built before the existence of any of the technology that shapes our current culture, they still fulfill exactly the purpose that they were designed to do, using materials and machinery that predates practically everything in our lives today. Pianos such as these were designed by craftsmen that for the most part used nothing but guesswork, experimentation and common sense. They were built by men who used hand tools and giant unwieldy machines powered by steam and horse power: machines literally powered by horses. Factory “Belly-Men” stringing upright pianos. 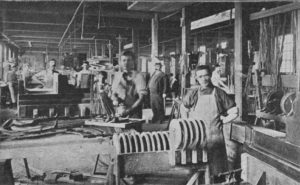 In a typical piano factory, a small group of men worked for months to build one piano. They sold for staggering amounts of money. 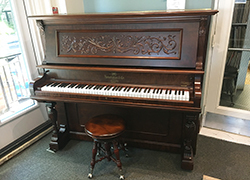 A good upright piano in the early 1900s sold for the equivalent of buying a luxury car today. The difference: A good car may, if you care for it, last for only around a quarter of a century, during that time having more money poured into it in the form of fuel, maintenance and repair. A piano, tuned at least once a year, may last for a century or more. Every Family in Canada during the early 1900s aspired to own a piano, as it was not only a measure of wealth and prosperity, it was astounding useful – often the only form of entertainment in a home. Hundreds of piano factories fulfilled this need, most of them, building pianos quickly, and charging as little as $500 – still a huge expense, the equivalent of close to $10,000 in today’s currency. A few factories strove to create the best instrument they could, building pianos slowly, with the best materials, and made by craftsmen that were the cream of the crop. In Canada, the best of the best was Heintzman & Co. If you had the money, and wanted the best, you bought a Heintzman. If you were a dyed-in-the-wool piano craftsman, you worked for Heintzman. 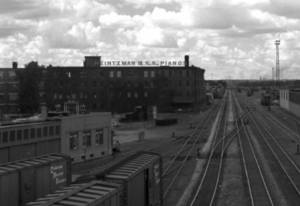 For over one-hundred years, Heintzman made the best pianos in Canada, and arguably, among the best in the world. A true Canadian brand, a Heintzman piano was not built as a fragile piece of art, but as tanks of the musical battlefield. They were designed and built to withstand the brutal conditions of the country as it existed then, cold long winters, scorching hot summers, and every conceivable climate in between: Humid or dry, Hot or cold, and delivered to these places in horse-drawn wagons or by train. Climate-controlled conditions did not exist, anywhere, period. Heintzman built pianos that would survive a sled ride to the arctic, a barge across a rural lake, in homes heated by open fireplaces, Franklin stoves, and coal-fed furnaces. Heintzman & Co. Ltd. was founded by Theodore August Heintzman. Born in Berlin Germany on May 19th 1817, he was apprenticed to the piano-building trade when he was just fourteen years old. As was common back then, he learned every aspect of instrument making: learning to be a machinist, a cabinet-maker, and an engineer. He came to North America in 1850 in order to reunite with his wife and her family, who had fled Germany during the March Revolution of 1848. They settled first in New York City, where Heintzman worked for the piano makers Lighte & Newton. 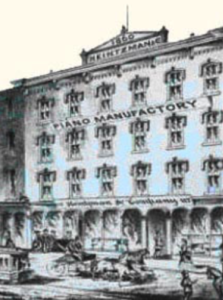 In 1852 Heintzman moved to Buffalo, where he worked, first for the Keogh Piano Co. And then in partnership under the brand name Drew, Heintzman & Annowski. With the American Civil War brewing, and possibly reminding him of the unrest that he had endured in “The Old Country” He moved to Toronto in 1860. He built his first Canadian piano that year in his kitchen, and sold it immediately, continuing and enlarging his business with the proceeds. 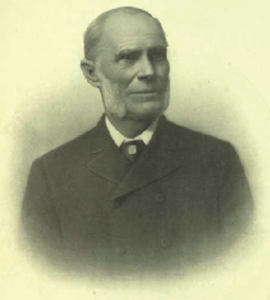 The company was incorporated in May 1866, with the financial and managerial help of Heintzman’s son-in-law, Charles Bender, a prosperous tobacconist. Heintzman’s second factory at 115-17 King St W.
Heintzman’s third factory in the Junction, at the end of what is now Heintzman St. 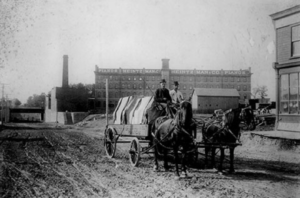 In the late 1800s, a new factory was built at the intersection of Keele and Dundas streets in the Annex District of Downtown Toronto. This factory had a long tunnel-like corridor built around the foundation of the basement that had two doors side-by side. Rough cut lumber would enter one door and placed in racks alongside a wet-furnace fed by shavings of the new wood. Every month the lumber was moved further along the racks until it emerged from the second set of doors two years later beside a dry-kiln furnace that heated the factory. Two years of slow seasoning made the wood exceptionally dry and resilient, perfect for building pianos for the Canadian Climate. Every year their pianos improved, until during the “Golden Years” of the 1920s, when they produced pianos of such durability and beauty that they were revered around the world. At Paul Hahn & Co., we are committed to preserving Heintzman’s legacy by employing the same old-world craftsmanship – restoring them to the highest standards possible.